Just brought home my first Claxtonola, "THE NEW DAY PHONOGRAPH". I thought they were all Golden throated..?? Has a nice 2 spring motor that worked great once I cleaned the springs and regreased them. It has a mechanism on the play surface directly in front of the tone arm base with a pad like a turntable brake but I can't get it to touch the turntable. Is it something else? See the pictures below. I'm pretty excited to have a Claxtonola. At last I have something to play my Claxtonola records on! It appears to be an auto-brake mechanism of some type... and looks like something is missing. If not, then maybe a tobacco cutting attachment? Thanks! Anybody know whether this brake was a factory installed accessory or an after market add-on? I haven't seen this mechanism on pictures of other Claxtonola machines. This is the first one I've actually had a chance to examine. 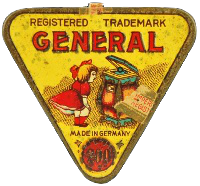 It is probably an aftermarket item, since the patent was originally assigned to the Empire Talking Machine Co. The logo on this machine is different than any other Claxtonola logo I've seen on records or other phonographs. Usually, the logo incorporates a 'flag' across the top saying "GOLDEN THROATED". This logo has a 'flag' along the bottom that says "THE NEW DAY PHONOGRAPH" and the CLAXTONOLA script is different. Are these different models? My guess is that Brenard started making Claxtonola phonographs, THE NEW DAY PHONOGRAPH. Then they started making Claxontola records to accompany their phonographs and modified their logo to GOLDEN THROATED. With all respect, why guess? Wouldn't it be better to know? A quick Google search (http://www.tedstaunton.com/labels/1920_ ... onola.html) would tell you that Brenard didn't make records. The earlier (1919) Claxtonola discs were produced for Brenard by the New York Recording Laboratories. Then in 1924, record production shifted to the Starr Piano Company (Gennett). This information (and much, much more) is also available in American Record Labels and Companies (1891-1943) by Allan Sutton & Kurt Nauck. Of course, none of this explains the change of advertising slogan. I'd suggest you compare the serial number of your "New Day" machine with other "Golden Throated" Claxtonolas to see if a pattern exists to suggest that the "New Day" nomenclature was a later attempt to counter the appearance of electrical recording and the Orthophonic/Viva-Tonal instruments. If your serial is higher than "Golden Throated" examples, you may be onto something. Meanwhile, check the Claxtonola advertising in the Talking Machine World (http://archive.org/search.php?query=tal ... pe%3Atexts) to see if you can pinpoint a date. The only numbers I can find on this machine were stamped into the wood, 1072 stamped into the bottom of the record storage cabinet and 212 stamped on the bottom of both record compartment doors. The web site for the record labels states Claxtonola records were made from 1921-1925 which roughly corresponds to the period when Brenard made Claxtonola phonographs. Still haven't seen anything to explain the NEW DAY PHONOGRAPH logo. I'm still inclined to think it is an early logo. Since they stopped making phonographs about the time Viva-Tonal and Orthophonic technology was developed, I don't think they were too concerned with competing. There must be another Claxtonola phonograph with the NEW DAY logo out there, just haven't seen it yet. Checking the ads in the Talking Machine World (1919 - 1925) might possibly settle the question. Looked through 1921, saw nothing related to Claxtonola. The lid was scaly and dull. Some elbow grease & Howard Restor-A-Shine helped a lot. Knocked the rough edges off the scales and polished up to be presentable. Still scaly, but not too dull.